Today is our last full day in the Anza-Borrego area. To say we’ve enjoyed it here would be an understatement. 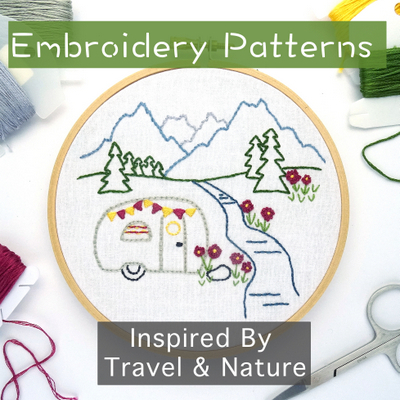 There’s something about the combination of unspoiled nature, small town charm and free camping alongside some wonderful fellow airstreamers that makes it hard to fathom the thought of leaving. Despite all this…and despite the easy living that comes with the lack of driving, planning and packing- we’ve both admitted that we’re feeling ready to move on. The wanderlust has started to kick in and the desire to see new places is starting to overwhelm the serenity that comes with staying in one place for three whole weeks. Which brings us back to today, our last full day in an amazing area that we are sure to visit many more times in the future. While we didn’t even come close to seeing the entire park, we did get out this week for a bit more exploring. 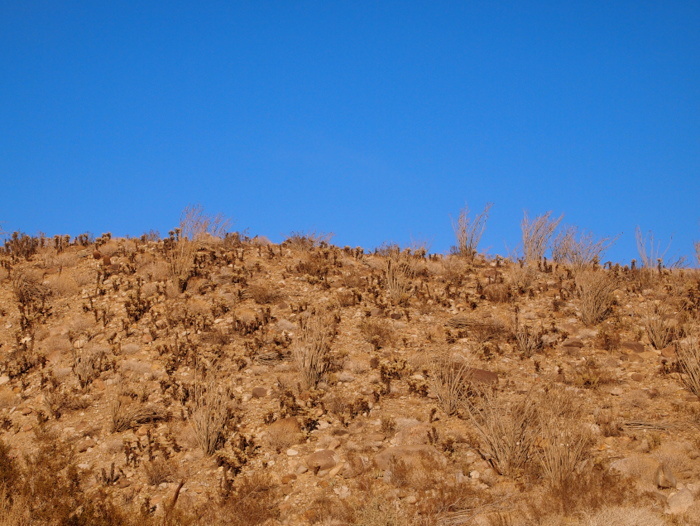 This picture was taken way up in the far northwest corner of the park in an area called Coyote Canyon. This is a part the park that can only be accessed by a rough dirt road. 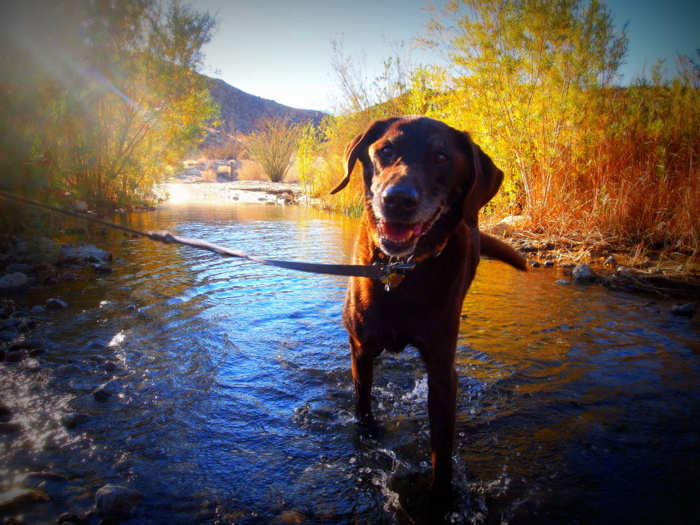 We followed the scenic desert road for a few miles before stopping to take Phineas for a short walk. There are some nice sounding hiking trails back there, but since dogs are not allowed on the trails we stuck to the road. There is a year-round stream that meanders through the canyon and crosses the road at several points. 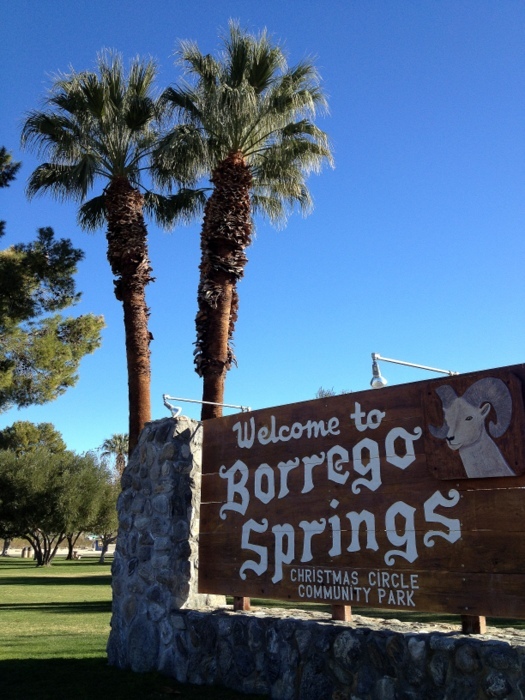 The creek is a water source for desert wildlife including the big horn sheep that the park is named for (Borrego= big horn sheep in Spanish). Sadly, we did not spot any sheep, but as you can see Phin was absolutely thrilled about the stream. I think he would have stayed there all day if we let him. 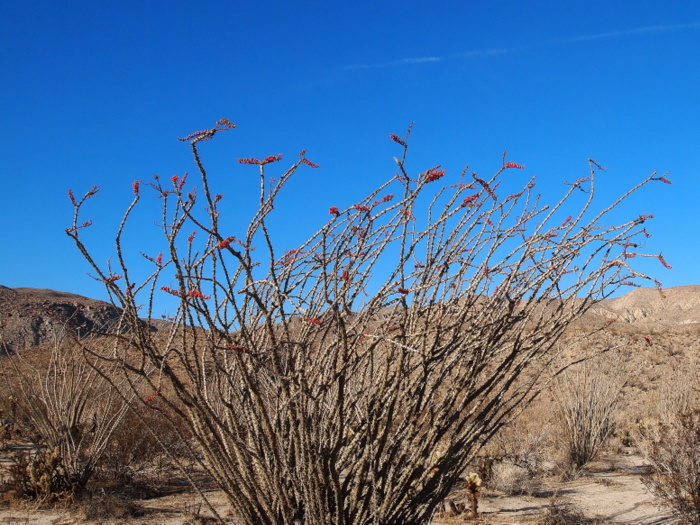 That landscape in the canyon was fascinating- full of several kinds of cactus, and of course, Ocotillo everywhere. 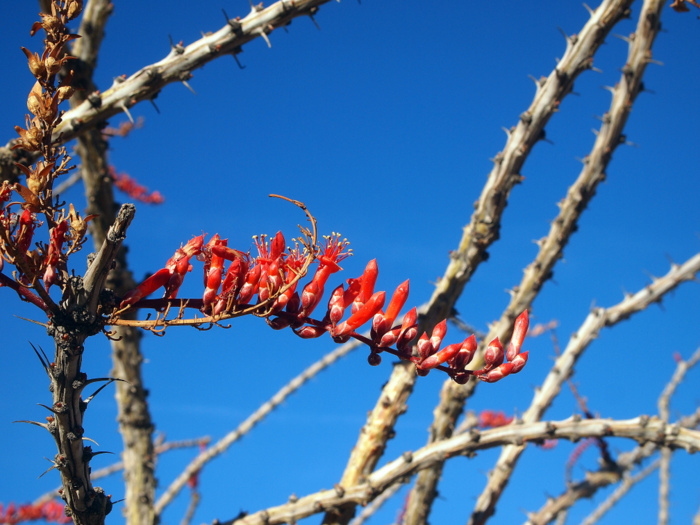 Remember when I mentioned how the Ocotillo sometimes have flowers? Well….we finally saw one that was covered in flowers! I know, I know, you’re thinking that it’s not very impressive. But come on people- it’s January- in the desert. We take what we can get out here. How about a close up? Maybe that will be more satisfying. On the way to and from the canyon we passed through a tiny portion of Borrego Spring’s roughly 2,000 acres of citrus groves. 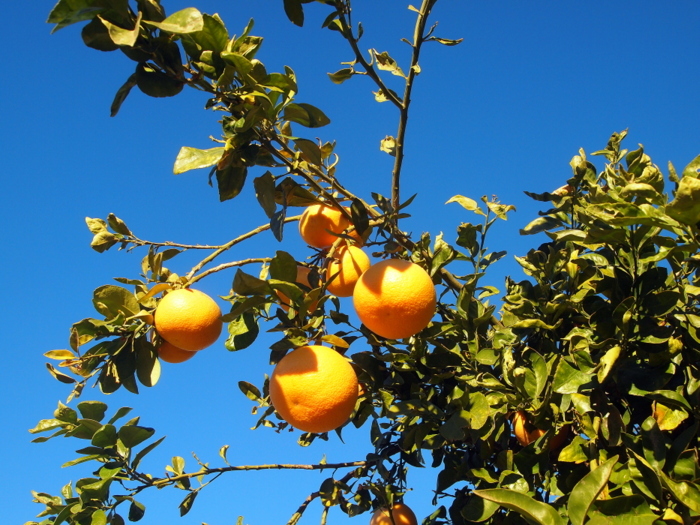 Grapefruit is the primary crop grown in the area alongside oranges, lemons and limes. I couldn’t help myself and made Tim pull over so I could get up close and personal with some of my favorite fruit. We also took a drive through and beyond the eastern borders of the park to the erie ghost-like town of Salton City on the edge of the Salton Sea. This is an intriguing place with an intriguing history, and after returning home and researching the history of the area I wish I had taken more pictures. For now we’ll have to make do with a few shots of the lake and my (extremely) wordy description. This is the Salton Sea. It is the largest body of water in California and it occupies an area roughly 226 feet below sea level. 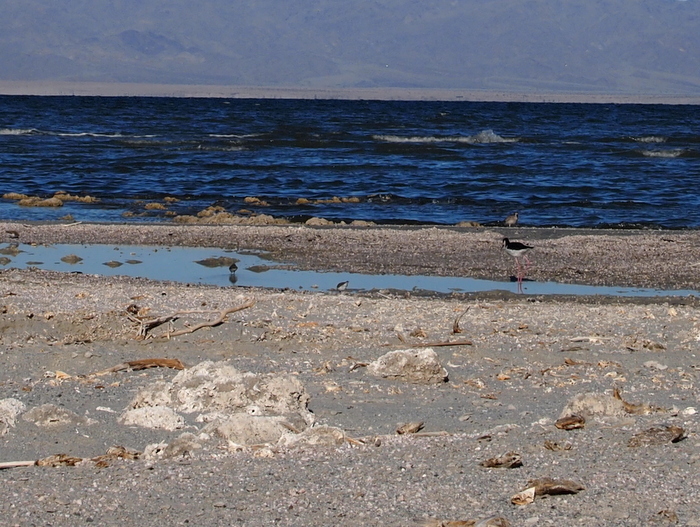 The Salton Sea has a a salinity level greater than the Pacific ocean and the polluted stagnant waters have devastated the area’s bird and fish population. It wasn’t always like this though. The lake was created by accident way back in the early 1900s. An unusually wet weather pattern in 1905 caused the canals constructed by the CDC to divert water from the Colorado river into the area for agricultural purposes to overflow into the low lying Salton Sink. No amount of effort was sufficient to stop the water and for 18 long months the entire volume of the Colorado River poured into low lying bowl shaped landscape. California’s largest lake was born. Though this was far from the first time in history that a lake had resided in this very location. For the past several million years the Salton sink had periodically filled with water whenever the Colorado overflowed its banks. Over the course of time the water always evaporated due to the oppressive heat and the area would once again dry out, leaving behind only a layer of salt and other minerals. This time things were different. Rather than evaporating as it had done over and over since prehistory, after the flood of 1905 the Salton Sea stayed the same size. 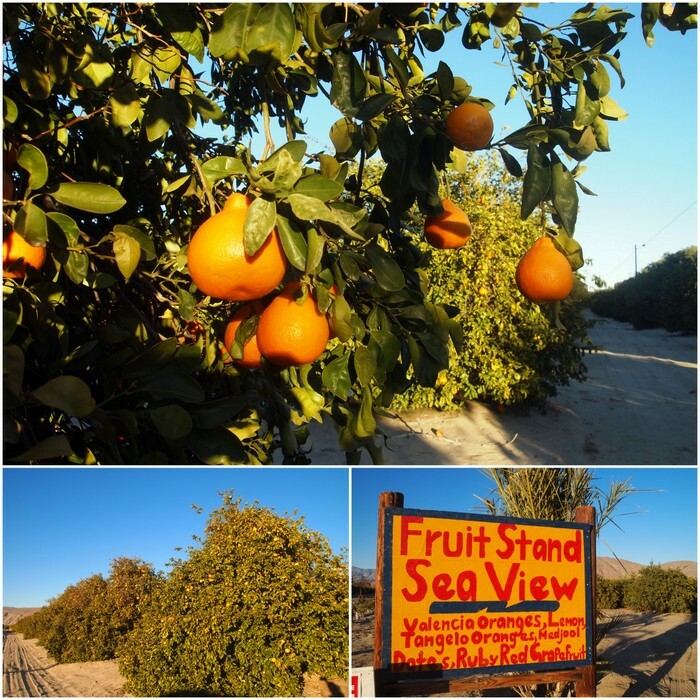 As it turned out, the Imperial Valley farms were dumping irrigation runoff water into the sea at the same rate as evaporation–about 6 feet a year. For a time this was a good thing. 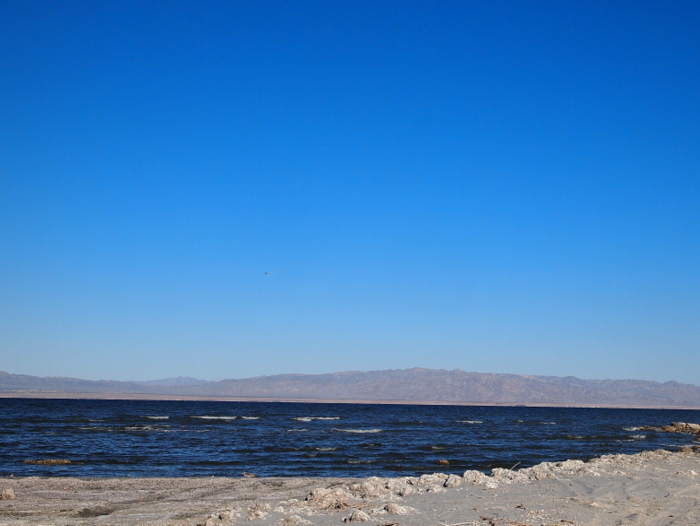 The dark blue waters of the Salton Sea turned the previously under populated area into a booming tourist destination. Starting in the 1920s Salton City was developed into a tourist attraction featuring yacht clubs, restaurants, and a golf course. Through the 50s and 60s celebrities and vacationing families flocked to this oasis in the desert, touted as the “French Riviera of California”. Unfortunately, over time things changed. Salt and fertilizer don’t evaporate, so as the chemical-laden water from the farms poured into the basin, they combined with the already saline mixture of the Sea. Since the Salton Sea has no outlet, the salt and chemical levels increased every year while the water level remained the same. The fertilizer in the farm run-off caused algae fields which turned into enormous rotten smelling, decaying matter as a natural part of its life cycle. This has resulted in a stench on and around the lake that at times can be completely overpowering. The story doesn’t end there. By the mid-1980s the rising lake and air pollution caused the tourists and many residents to abandoned Salton City, leaving behind a ghost town full of empty buildings and run down vacant lots. At the same time the wildlife die-offs began. First the fish began dying in astonishing numbers as the algae depleted the oxygen from the water. After feeding on the rotting fish, the birds contracted botulism. Almost every year through the nineties, tens of thousands of dead fish and birds washed up on the shore of the Salton Sea. In the summer of 1999, 7.6 million Tilapia died from oxygen starvation caused by the overabundant algae. Their rotting carcasses rimmed parts of the Sea for over ten years. Today, despite clean up efforts the shores of the Salton Sea are still covered in some spots with dead fish carcases. The story of the Salton Sea is far from over. The fate of the Sea is currently up in the air due to proposed litigation that would divert the farm run-off away from the sea. Without its constant water source the sea will surely dry up leaving behind a dust bowl of pollution. Despite it’s history of pollution, the lake has become an important natural habitat for many migratory birds. For this reason efforts to clean up the water and turn the lake back into a safe place for recreation and wildlife is the dream of many, but considering the scope of the problem it may never come to fruition. For now the Salton Sea retains its place as California’s largest body of water. It is also remains a tourist destination with a state park that lies on the eastern border of the lake. Many come to see the migrating birds, many more come to see the devastation caused by years of human derived mistakes. As you can see, I was completely taken in by the story of the Salton Sea and Salton City. As we drove around the town past abandoned houses, empty lots and street signs to nowhere it was hard to believe that the town currently has a population of nearly 4,000 residents. I can only hope that things will change for the better in this area. Both for the wildlife who call the lake their home and the people who I can only imagine are barely eking out a living in what was once a booming tourist town. I apologize for the long string of words with no photos. But it was something I really wanted to write about and as much as I tried to keep it short the words just kept coming. So…how about a picture of some palm trees in a much nicer town to make up for it? 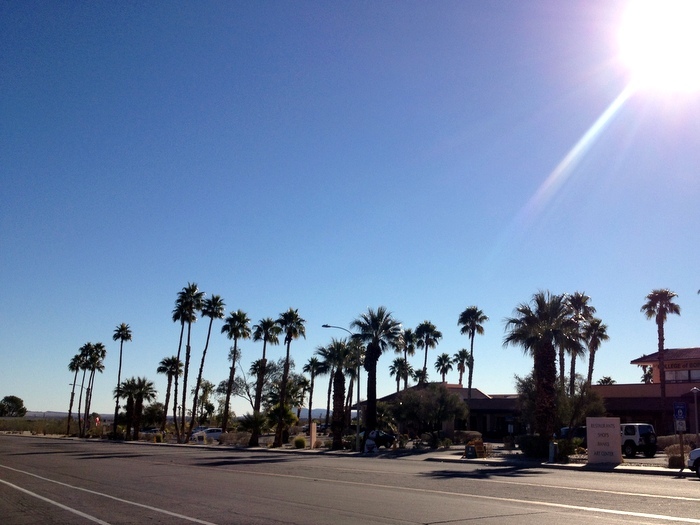 This is the sun-filled, palm tree-lined main street of Borrego Springs. I realized that after almost three weeks here I have yet to post a single photo of the town. So after a quick stop at the market this morning I took a few to share. It’s a very cute town with several restaurants, a small food market, a couple of touristy gift-type store and not much else. Last night while hanging out with Brian and Leigh we were marveling over the lack of chain owned business in town. In fact, there are none. Not a single Applebees, Rite-Aide, or Dollar General in sight. It’s very refreshing. Traveling around the country really reinforces the sad fact that so many of our towns and small cities contain essentially the same string of business over and over again. It’s really nice to visit a town where they appear to have everything needed to sustain a population of about 3,500 full-time residents plus countless winter time visitors all with locally owned businesses. There you have it. A wrap of of our last week in Anza-Borrego. Tomorrow we’ll be moving east to the California- Arizona border near the town of Yuma. What awaits us there is more free camping, another meet-up with some fellow RVers and hopefully many more adventures. Hehe…we’ll miss you too :) See you on Sunday! Lovely roundup of our fav spot. So you guys coming to Yuma to see us? Lots of boondocking space out here and we’d love to see ya. Yes Nina! We are in fact coming to your neck of the woods (or the desert I should say). The original plan was to check out Mitry Lake but after further research it doesn’t sound as good as where you are. We’re leaving this morning and should be there sometime today. Hope to see you!!! I had faith you would find those Ocitillo flowers. Thanks for including that photo. It was exciting to spot them!